The new restaurants will be a big boost to the rejuvenation of the shopping complex in Jenks. via Table Talk: Andolini’s Pizzeria, Maryn’s Taphouse & Raw Bar coming to RiverWalk Crossing. Great news for Riverwalk! 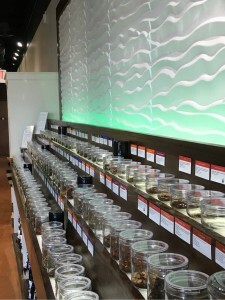 Trader Leaf Tea & Gifts is open in Building 500 next to Cigar Box. Come by for a sample! Simon Premium Outlets moving along as planned at River District. The Jenks City Council unanimously approved changing a tract zoned for agriculture to Riverfront Tourist Commercial to accommodate the Tulsa Premium Outlets, clearing the way for permit applications and work to begin. The approved outlet mall site is due south of the Oklahoma Aquarium. It is bordered on the north by the Creek Turnpike and to the east by the Arkansas River. The outlet mall that met backlash from people who use trails on private land near Turkey Mountain is officially building in Jenks, the developer said Friday. The announcement from Simon Premium Outlets came months after the development group’s brochure had called Jenks the home of Tulsa Premium Outlets and Jenks Mayor Kelly Dunkerley confirmed the move. Construction on the outlet mall is scheduled to start in the spring of 2016, with an opening in summer 2017, according to the announcement. The first phase of the development is planned to encompass 325,000 square feet with 80 to 90 retail options. The new site is along the south side of the Creek Turnpike just west of the Arkansas River in Jenks’ River District. “We are eager to serve the entire Tulsa metropolitan market from this location,” said Mark Silvestri, COO of Simon Premium Outlets. “We are really looking forward to bringing our vision of value shopping, which has been extremely popular throughout the world, to Tulsa”. The statement from Silvestri did not address the move from Tulsa city limits into Jenks, which Tulsa officials have been hoping to avoid for months. The original plan for the mall to be built near Turkey Mountain drew strong reaction from Turkey Mountain Urban Wilderness patrons who feard that the outlet mall would encroach on their outdoor activities and the natural setting. The wilderness group was not the only group that opposed it, but in the end, Simon reached out to Jenks, which had land ready to go, Jenks Mayor Kelly Dunkerley said previously. The move to Jenks strips the city of Tulsa of an estimated $4 million to $5 million each year that would have gone into the city’s sales-tax-based budget. FlyingTee is a sophisticated and interactive high-tech golf, dining, and entertainment venue. Modeled after contemporary sports stadiums, FlyingTee pairs a multi-level sports bar and restaurant with a modern, technology-driven golf gaming experience via 60 semiprivate hitting bays and suites on a full-size driving range. The Riverwalk experience will be something to remember as FlyingTee puts down roots in this exciting area of the community. FlyingTee and the Muscogee (Creek) Nation have come together to bring this project to life. FlyingTee, a new state-of-the-art golf and entertainment venue, has chosen the beautiful Riverwalk Crossing in Jenks. FlyingTee, will be a place for friends and family to come together for golf, fun games and great food. This new and innovative venture is scheduled to have Oklahomans ready to tee off by early 2016. The new “Tee-Town,” FlyingTee, will redefine fun in Oklahoma. An outlet mall slated for the Turkey Mountain area is now headed to Jenks, according to an investor’s brochure from the developer and the mayor of Jenks. Simon Property Group now intends to build its Tulsa Premium Outlets mall on land across the Creek Turnpike from the Oklahoma Aquarium, Mayor Kelly Dunkerley said Wednesday night. According to a Simon Premium Outlets brochure created for investors earlier this month, the Jenks site will have 325,000 square feet of leasable space with 90 stores to open in the spring of 2017. Officials with Simon and the city of Tulsa were not available to comment Wednesday night. In December, Simon Property Group unveiled plans for an outlet mall on private land near Tulsa’s Turkey Mountain Urban Wilderness Area. That plan for a 48acre development with more than 350,000 square feet of leasable space drew strong reaction from Turkey Mountain patrons who feared that the outlet mall would encroach on their outdoor activities and the natural setting. Dunkerley said most of the infrastructure needed to develop the Jenks site is already in place. City of Tulsa officials have said how to pay for infrastructure in the Turkey Mountain area had not been determined. According to Tulsa County Assessor’s Office records, the Jenks site is owned by the River District Development Group LLC. The land is already under contract for Simon Property group, according to a statement from the city of Jenks. Dunkerley said the site is already part of a tax increment finance district, and Jenks residents in 2013 passed a road funding package that included streets in that area. The roads will be constructed in conjunction with the Oklahoma Turnpike Authority and will be ready by the mall’s planned opening in 2017. Earlier this month, Tulsa officials were in discussions with the developers to look at a land swap that would keep the mall and resulting sales tax dollars in Tulsa. As previously reported, the proposal would have Simon Property Group purchase the property it has under contract at 61st Street and U.S. 75 and could then swap that land with the city of Tulsa for the Bales Park property, a 67acre tract on the opposite (west) side of U.S. 75 at 5801 S. Union Ave. The Jenks site, just west of the Arkansas River, east of Elm Avenue and south of the Creek Turnpike, has been the focus of previous development proposals that have not panned out. Originally, the River District Development Group was pushing for a development with 852,000 square feet of upscale and unique shopping at a price tag of $1 billion. A host of restaurants, office spaces, condominiums, hotels and a performance fountain were in the plans. At one point, the site was pitched as a home for a new Tulsa Drillers stadium. The 300acre site was cleared years ago, but developers said the slumping economy and a lack of capital slowed its development. Tulsa, Oklahoma based leader in Commercial Real Estate, Paine and Associates, has selected Archetype SC to redesign their web presence, designing and engineering their complete digital experience. The centerpiece will be a new website, designed to showcase the offerings and capabilities of Paine and Associates as they service their diverse client base. “We are confident that this step will contribute to and push forward the growth of Paine and Associates as they continue to adapt to the changing market and grow their presence nationally” said Joe Bonanno, managing partner at Archetype SC. Since 1998, the members of Archetype SC have served the professional community by developing solutions for security, productivity, and user experience needs. Our process is simply beautiful and yields beautifully simple results for our clients. We know each client is unique with complex situations, and we design our solutions based on your needs. A collaborative approach, based on a thorough understanding of and partnership with our clients, is the critical component to our success. Companies from startups to Fortune 500 have trusted us to build their solutions. Bring us your complicated security, user experience or analytics problems…we do complicated. Archetype SC.